The Eurasian History and Memory Visual Archive centers on the experience of Eurasian mixed-race families. Featuring photographs, newspaper cartoons and illustrations, paintings, and film—as well as historical texts related to Eurasian cultural history in China, Hong Kong, and the United States, the archive is designed to enhance research into such scholarly issues as Eurasian identity, migration, and social life. Information from seven important families forms the core of the material. 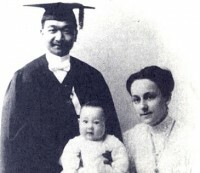 The prominent Ho family of Hong Kong—including Sir Robert Hotung (1862-1956) and Ho Kom Tong (1866-1950)—will be the focus of the expanded archive, which is slated to contain more than 1,000 photographs and approximately three hours of 16 mm film documenting the family’s history. Students of Chinese culture can use the archive to sort and categorize information—for example, to focus on the education of women in the family, or on what businesses the families pursued.